It might sound absolutely crackpot, but what if you were told that those flowers you keeping your eye on for aesthetics and pleasure are actually quite potential generators of electricity? Indeed, vegetation could soon provide us with considerable electric power thanks to revolutionizing modular systems. And for just as little as 80 bucks you can become a mister techie and generate electricity right on your windowsill. Electricity generation runs the world, our modern society and everything surrounding us. There’s always a big demand for electricity, thus different companies that are working on developing new technology aim directly at seeking alternative sources of energy to grow more powerful, bigger chains of electrical influence. 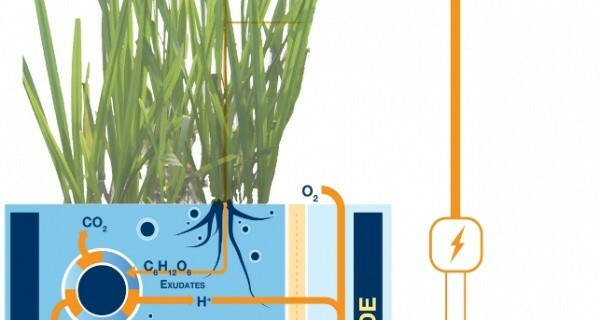 Notably, one Dutch company in particular with a remarkable name Plant-e has right those ambitions – for the record, its developers have managed to create affordable technology in which plants can produce electricity by tapping into the power of photosynthesis. In fact, the system is not quite groundbreaking: this technology to obtain power from plant energy closely resembles school science and potatoes when you stab the poor vegetable with electrodes to release a little bit of electricity. But, of course, the technology developed has a lot more complicated background than school experiments. Plant-e presented their innovative systems in autumn 2014, at one of local Hemburg parks. In a project named ‘Starry Sky’, the company demonstrated a magnificent spectacle of more than 300 LEDs drawing solely on the natural power that was generated by aquatic plants. Interestingly, but they aren’t looking for some impressive marketing – the company also uses the technology and their systems to light up its headquarters, though partially. The company is also are also keeping their eye on local bogs, swamps, river deltas and wetlands where they could generate power for things like nighttime lighting and Wi-Fi hotspots. What about numbers? It is claimed that one sq. m. garden should produce around 28 kWh which, in other words, would allow to power an average American house. Even though the technology doesn’t sound completely pragmatic at the moment, there are numerous places where people consume twice as low energy while lots of other people worldwide have no access to electricity at all, but have plenty of gardens or wetlands. Farmers can rejoice, but what’s in there for cities? Well, the Dutch are continuing to test their modular rooftop systems which may be enough now to charge a phone. Though it doesn’t leave an impression of vital importance, we can clearly see small steps towards the technology of renewable energy. Besides, they insist on their technology being revolutionary due to the fact that this method is 100% safe in terms of ecological damage. And with the possibility to develop the model to an industrial scale, their technology has potential of a lifetime. So, what’s really going on inside? During the process of photosynthesis, leaves absorb sunlight, and under the influence of sunlight plants start to produce oxygen and sugars from carbon dioxide and water. The main factor here is that the sugars are being transported throughout the plant that naturally ‘summons’ bacteria which, in turn, surround the roots and begin breaking down the sugars. It releases protons and electrons. What are electrons? Right, energy. Once a conductor is inserted into the soil, it collects these electrons which then turn into electricity. The reason why the idea seems perspective is due to a totally harmless process: a plant tends to produce way too many sugars, so nothing interferes with the growth – veggies are still able to reach up for the sky. So, the company offers sustainable and safe energy, not some plant parasitic systems killing green life.